In for repair is an Ansonia kitchen clock with alarm. 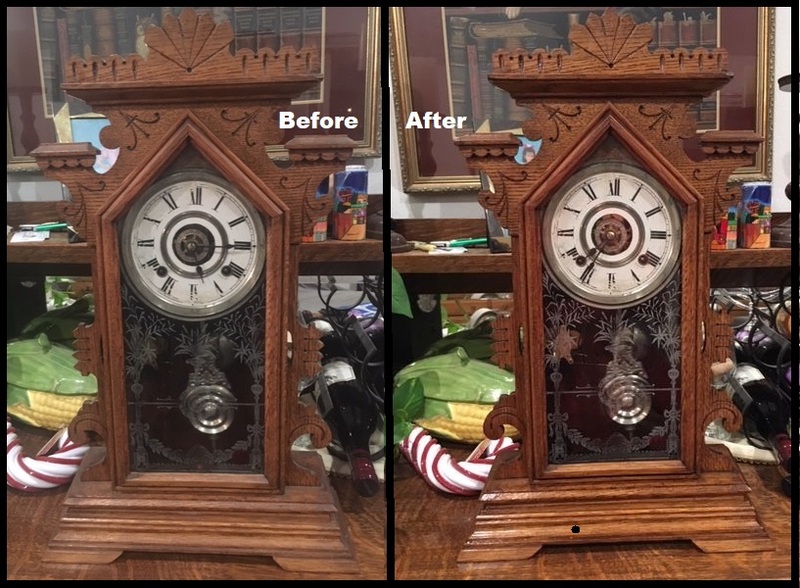 Below is a picture of the clock as it was brought into the shop. A nice looking clock. Basically in good shape. The wooden case was dry and the face showed a little wear. This clock was made about 1890 showing a patent date of June 18,1882. Click this link for a brief history of the Ansonia Clock Company. These kitchen clocks before the 20th century were usually made of oak. After 1900 most clocks were made of pressed wood making unique designs. The pre-1900 clocks were called "Oakies". These kitchen clocks usually had a label on the back of the case. This label identifies the model of the clock. Unfortunately, the label on this one has worn off. There are similar case styles like the "Beaver", "Australia", & the "Amazon" which have similar characteristics but the cases are very different. The similarities include Roman numerals and nickel trim with a nickel pendulum. The movements are an 8 day mechanism with an hour and 1/2 hour strike. The symptoms reported by the owner was the clock would not keep time. It would run ok for awhile then the time would be off.. Upon removing the hands and face, it was apparent that the movement was very dirty especially on the strike side mainspring wheel. Note the red arrows showing the clumps of dirty grease. Inspection of the pivot holes showed significant wear on both the time and strike sides. There were 6 pivot holes that required rebuilding. The first video shows the time train and demonstrates the wear. The 2nd video demonstrates the strike side wear. The alarm was tested. It would not wind. After a little more digging into the alarm mechanism, it was found that the mainspring because un attached to the winding arbor. This was repaired and working great. I suspect that the alarm was wound backward and the end of the mainspring because unattached. Below is a picture of the alarm mechanism out of the case. The image was taken after the repair and after ultrasonic cleaning. Pretty shinny! As stated earlier, there were 6 pivot holes that were worn and needed rebuilding. Other items tested was the mainspring clicks, mainspring strength, pivot smoothness. All were excellent considering this clock is about 130 year old. Here is an image of the clock in pieces and after all work is completed. Lots of pieces. After all work is completed, all the wheels, levers, plates, and mainsprings were cleaned ultrasonically with hi-grade clock cleaning solution. After initial cleaning a brass wire brush was used to remove any hard to remove grease and debris. The clock parts were then rinsed and dried. The next step is assembly. Here is the clock running on the test stand. Any major adjustments are made at this point. Mainly because the movement is out of the case and adjustments can be made easily. While the movement is running on the test stand, the case was cleaned up and oiled. The application of hi-grade wood oil made a big difference in the case presentation. The door hinges were loose and were tightened. The glass was also cleaned. In this case the case was very dry. The pendulum was also polished with hi-grade polishing wax. This really made a difference but kept the patina. After the movement passes initall testing (for about a day), the movement is then put in the case and further adjustment is made. The case is leveled and the crutch is adjusted so that the clock will be "in-beat" or the tick-tocks are evenly spaced. The clock will not run if the clock is not "in-beat". Included in this testing is to install the alarm mechanism, then hands, and face. The clock was watched and adjustments are made to set the speed of the clock. Click here for a short video of the mechanism running in the case.